Grace came to PAWS along with 38 other tigers from the infamous Colton tiger rescue. PAWS Cofounder Pat Derby, and our veterinarian Dr. Jackie Gai, first traveled to Colton, California, in 2004, to meet with representatives from Fund for Animals who had been caring for the tigers since legal action was taken by California Department of Fish and Game against the owner of the facility. They were introduced to Grace, a Sumatran-Bengal mix tiger with a mysterious skin condition, who was housed in a small cage next to a male tiger named Gus. Attempts had been made to find the cause of her patchy hair loss, but it was not known at the time. Grace and Gus arrived at PAWS' ARK 2000 sanctuary in 2005. For the first time in their lives they roamed together in a large habitat with grass, trees, rolling hills, and fresh water. On a healthy, nutritious diet, Grace transformed with rich color in her coat, toned muscles, and bright eyes. Her skin lesions persisted, however, and Dr. Gai began work on diagnosing the cause - collecting biopsies, fungal and bacterial cultures, skin scrapings, and prescribing various medications to treat the most likely causes of dermatitis. Most test results remained inconclusive until 2006, when an astute pathologist (after a second opinion was requested) suggested that Grace may have epitheliotropic lymphoma - an exceedingly rare cancer in domestic cats, and a cancer that has never been reported in tigers. This unusual diagnosis was confirmed by specialists at the University of California, Davis (UCD). Consultations with UCD veterinary dermatologists and oncologists helped to design treatments for Grace to keep her healthy as long as possible. PAWS' dedicated carnivore keepers doted over her, and made sure that she was always comfortable and content. From the time of her arrival in 2004, until her passing this year, Grace enjoyed a rich, nurturing and comfortable life at PAWS with her companion Gus. Aptly named, she handled her illness with grace and dignity - surprising her team of veterinarians with her strength and longevity. As with many rescued animals, we never knew her actual age as no health records were kept in Colton, but she was estimated to be at least 17 years old and possibly much older. Grace lost her battle with cancer and renal failure on July 11th. 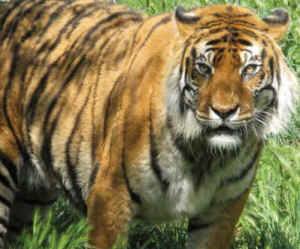 We will all miss this gentle-natured and beautiful tiger tremendously.